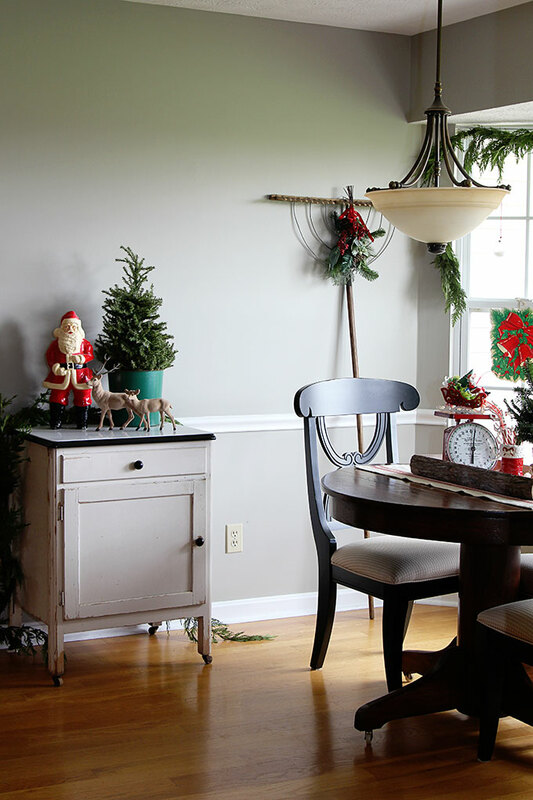 I’m so excited to share my Christmas breakfast room with you today and in the process give you some ideas to help you create a nostalgic Christmas. 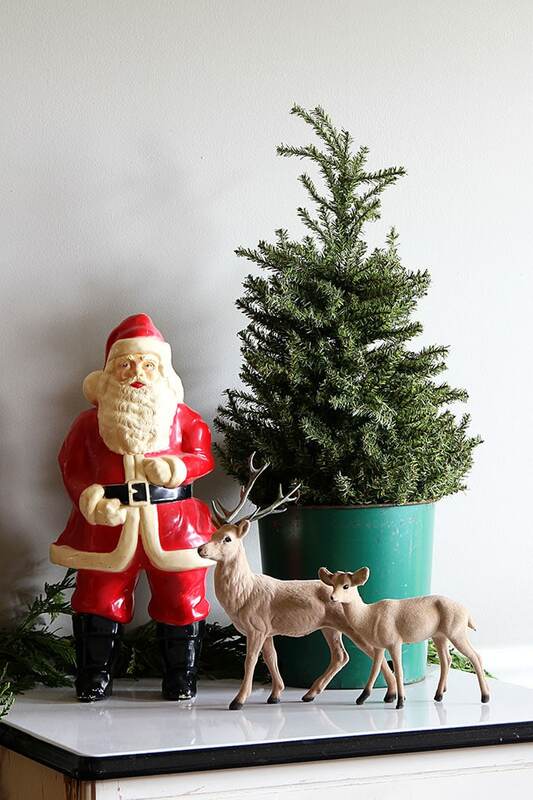 Now, before we go any further you must know that I adore vintage, red and green, Santa’s in the house sort of Christmas decor in my home and my Christmas breakfast room is no exception. Subtle is not my middle name when it comes to Christmas decor. Now, for me, Christmas is a time for nostalgia, for reminiscing, for honoring the past. And what better way to do that than pulling out family heirloom pieces. Or vintage pieces you have recently acquired. Just because it didn’t originally come from your family, doesn’t mean it doesn’t deserve a place of honor at Christmastime. 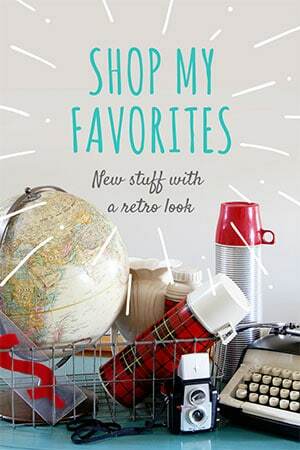 And thrift stores, estate sales and yard sales are killer places to find new-to-you family heirlooms. 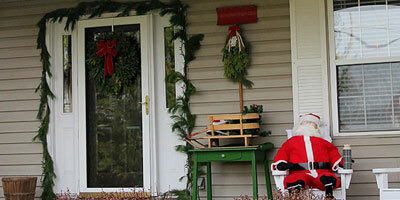 For instance, this vintage plastic Santa and sleigh was bought at a local thrift shop for a song. Last year I had it on top of my globe (traveling the world in one night) and this year he’s weighing himself after having eaten too many cookies. Love the body you’re in Santa! The Santa pitcher was also a thrift store find. The paint is a little chippy on it, but that just gives it character. 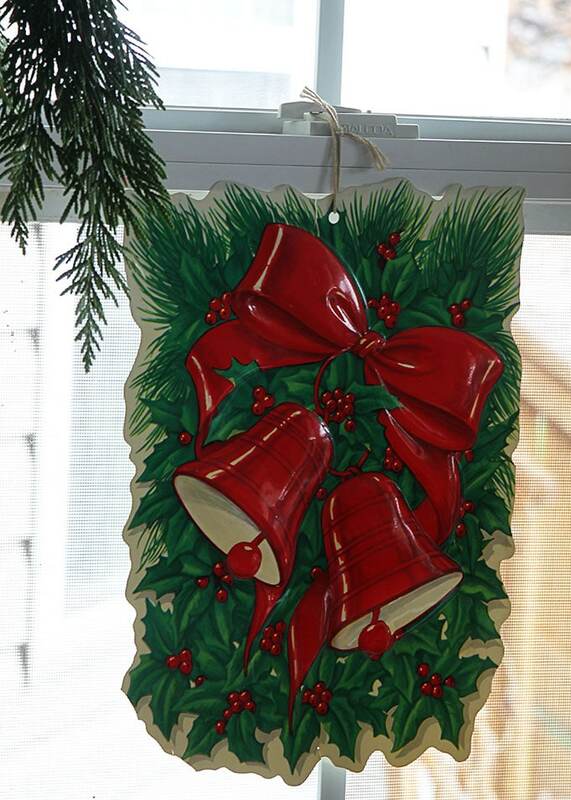 I found two of these plastic hanging things at the antique mall a few weeks ago and I had to buy them. I think they were a dollar each, so no reason not to. Let’s overlook the fact that I took at least 7 boxes of old Christmas decor to the thrift store this week. 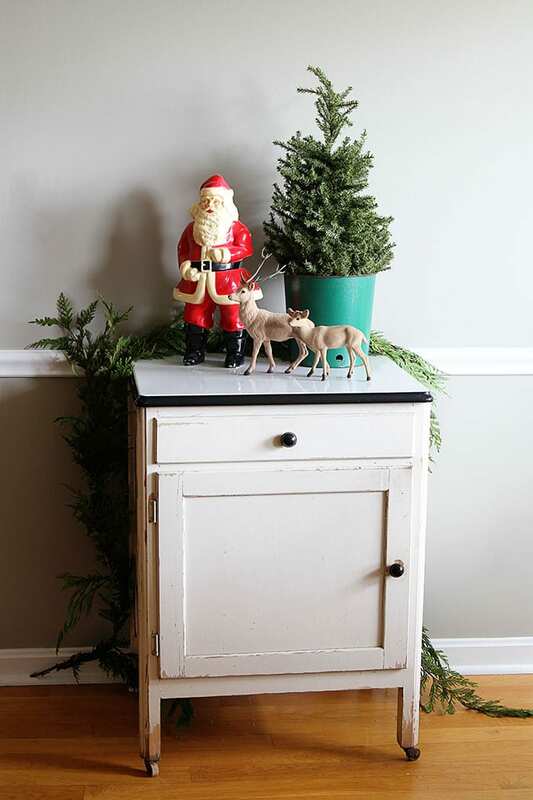 This Santa made his first appearance this year in my Vintage Farmhouse Christmas Decor post. He’s quite the ham and insisted on being featured again this time. 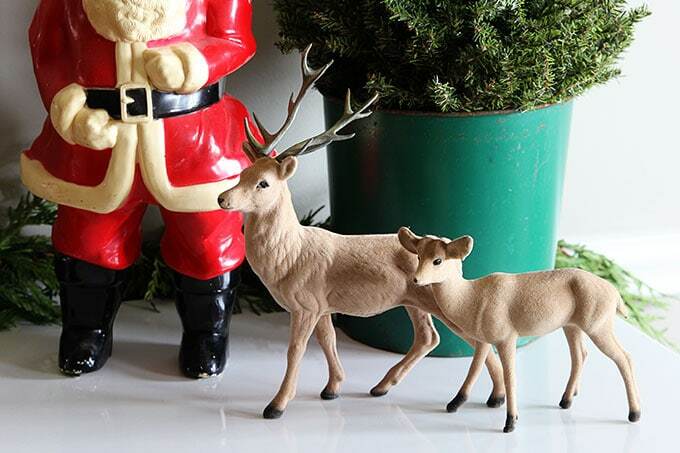 The deer are also thrift store finds. The baker’s cabinet is one of my all-time favorite yard sale finds. Ever. Do I have to keep saying that? 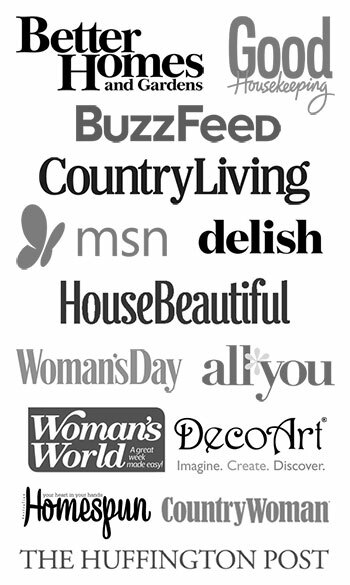 Pretty much anything you see here comes from an estate sale, thrift store or yard sale. 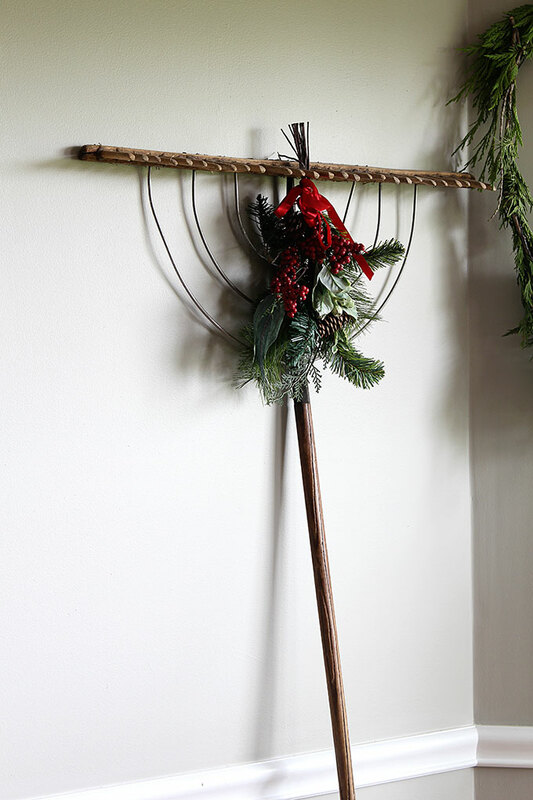 On the other side of thrifting, I was just getting ready to take this vintage wooden hay rake to the consignment store when I made the mistake of hanging Christmas greenery on it. And now I’m in love with it all over again. I have a feeling it isn’t going anywhere soon. Last year I had curtains in here that I had made from an old vintage Christmas tablecloth that had seen better days. 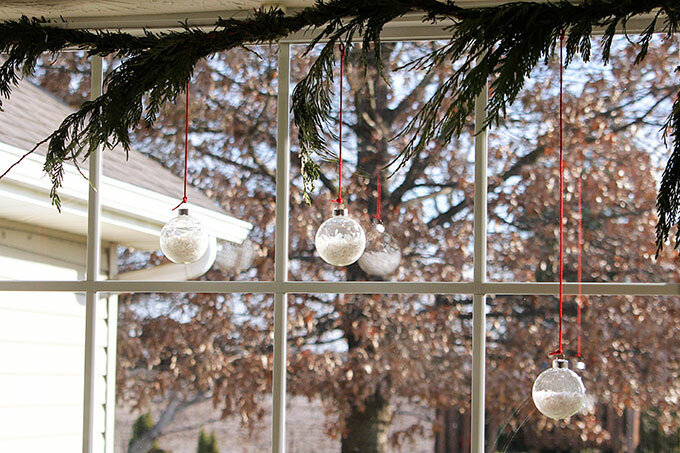 This year I wanted something different, so I went with hanging greenery as my “curtains” (it’s just wired onto the tension rods) with glass ornaments filled with fake snow hanging down. I love how the sunlight hits the snow in the morning. 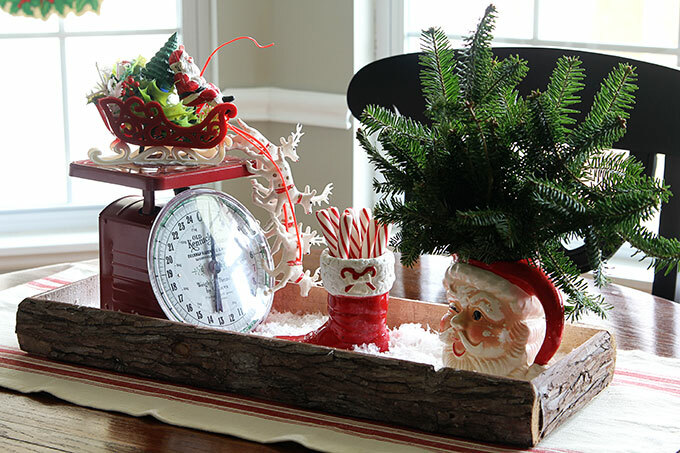 I hope that gives you some ideas for using nostalgic Christmas decor in your home. Whether family heirlooms or vintage pieces recently acquired, it’s all good! I love the greenery you’ve used in your breakfast room, Pam. You’ve given me an idea of what to do with the hay rake that’s still outside our back door. 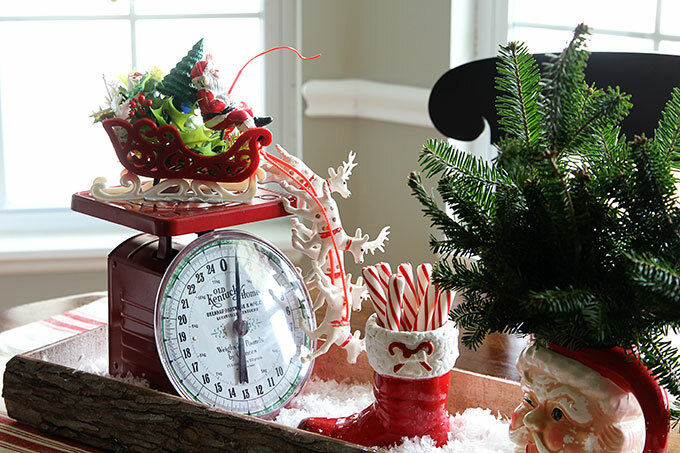 I love your vintage touches, and to me it’s not Christmas without red & green and a few jolly old fellers hanging out. Pretty ornies hanging in the window, too! Love all the greenery! 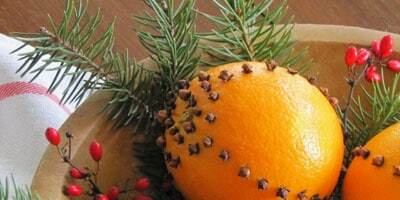 I am going to get some this weekend when we get our tree and add it to some of my displays. Hopefully the dog doesn’t try and chew it up! Oh, no. And then you’d have to deal with dog barf on the carpet too! I’m really surprised that neither of my dogs have been too interested in the greenery on my coffee table. So far, so good. Pam, I love it especially that rake! I think I paid $5 for that at a yard sale. I don’t know what they were thinking, but I grabbed it and didn’t ask questions. 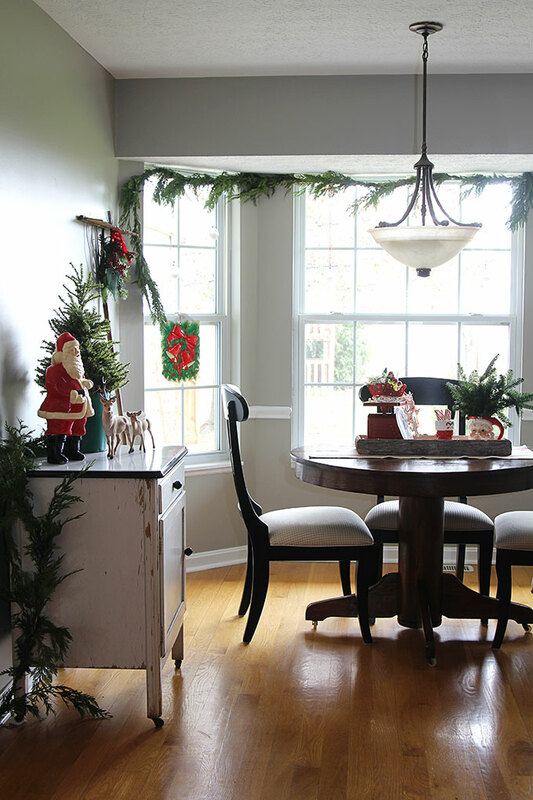 Pam, I love all the vintage holiday touches in your breakfast room! What a great bay window area to dine in!! Thanks so much for joining the tour! Thank you so much for inviting me. I’ve enjoyed seeing everyone else’s decor so much! Love it all, Pam! Your Santas are so charming…and you’ve inspired me to do something with the clear ornaments I have just sitting in a box! You have a wonderfully whimsical style that I just love! Lots of fabulous ideas in this post. I just love the fresh greenery as your curtain valance. 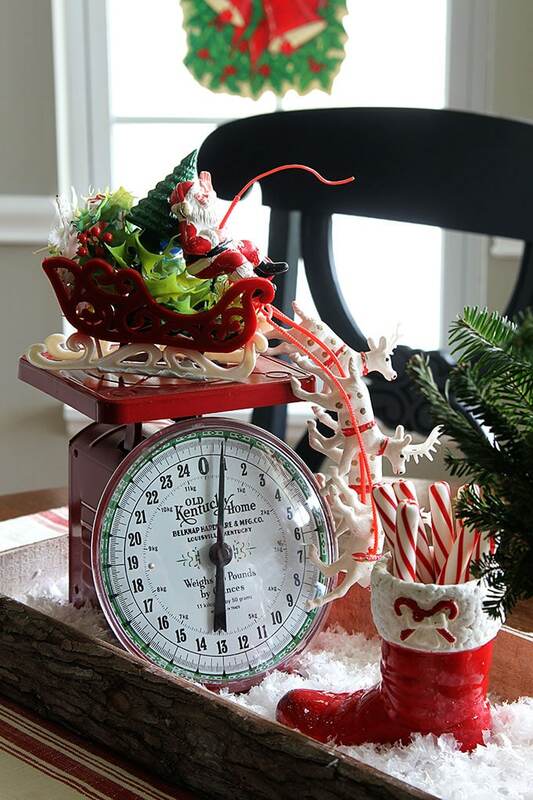 Love the Santa scale too. Christmas hugs! Not only do you find great vintage pieces you know how to style them. 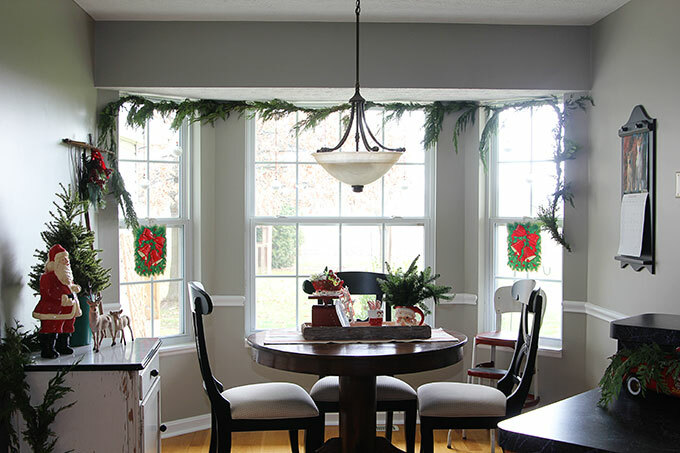 The breakfast nook looks pretty for the holidays. Pam I love your vintage Christmas decor! You always find the best vintage treasures. Your room is so beautiful. 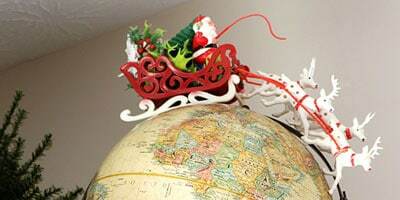 And I love that you’ve added Santa and the reindeer on top of your globe. What a fun idea! Merry Christmas! Love the greenery used at your windows! Adore all of your vintage pieces! it is all so pretty! I’m eyeing that gorgeous scale!!! What a find. Merry Christmas!